(above) UMOJA Men’s Chorus (Warren Correctional) prepares for the World Choir Games in Cincinnati; the international panel who came to the prison to ajudicate these singers awarded gold medals in the categories of spirituals and gospel. Professional circumstances took me from creating and leading women’s choirs to creating and leading men’s choirs. In the early 1990s, when I was on the music faculty at Wilmington College (a Quaker school), the Dean of Correctional Education asked me to start a chorus as part of our Fine Arts curriculum at Warren Correctional Institution for men. In 1993 I founded UMOJA Men’s Chorus with seventeen singers. UMOJA was the first chorus of its kind in the nation, though today prison choirs led by outside choral professionals are numerous—and still proliferating across the country. To date I have founded men’s choirs in three prisons (also UBUNTU at London Correctional and KUJI at Marion Correctional). This work has been important to me on many levels, including my selfish concern for my own education—about race, racism, mass incarceration, the prison-industrial complex… about what happens to humans in a perfected culture of punishment. 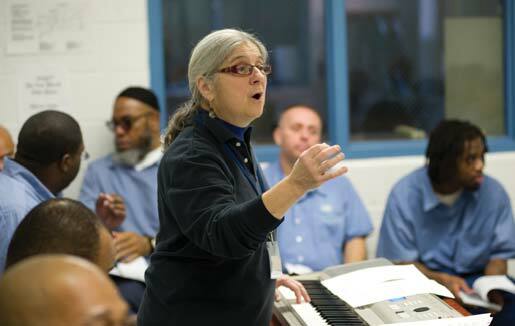 I have been motivated by seeing the impact of choral singing on the inmates’ lives as they develop a spirit of engagement, and as our culturally adventurous repertoire inspires their hunger to learn about the world. I am driven to helping the silenced to sound their experiences through song and to accomplish feats they had never fathomed. I want the outside world to understand that deprivation and control are not the ways to rehabilitate and heal. The men with whom I’ve worked for over twenty-five years have formidable listening skills that are greater than my own and complementary to my notational skill. Our distinct sets of experiences contribute to our engaging musical environment behind bars, where I can put my servant-leadership model fully into action. Shortly into my work with these men, I recognized their interest in writing original songs for the choir to sing. I encouraged them to write inspirational music derived from the values that influenced them, music that expressed their hopes and dreams: what was it they wanted to communicate to an audience outside the prison walls? I developed a process for working with these songwriters that helped me teach score-reading skills to the larger group. When a singer had a piece ready to share, I made a rough recording and then created a piano-vocal transcription. I found I could effectively use that arrangement as material for teaching interpretation of basic rhythm notation, meter and tempo markings, and indications for dynamics, phrasing, and articulation. In the material represented on the four CD recordings I made with UMOJA, twenty-nine songs were composed by choir members. It was during our work on the third CD project (1) that I realized: the compositions these men had created were truly new spirituals, written in the gospel, pop, funk, hiphop, and ballad idioms. While uplifting and transcendent, these songs revealed the conditions of mass incarceration. Like their nineteenth-century counterparts about refuge, release, and resistance, these new spirituals gave the men a sense of hopeful determination and provided a mental escape from the confines of the prison walls. HOPE Thru Harmony Women’s Choir (Dayton Correctional) and Earlham College Women’s Choir, with the composer present, perform Crossings, Dr. Ysaye Barnwell’s thirty-minute work for chorus, narrator, and dancers. John Lovell, in Black Song: The Forge and the Flame— the Story of how the Afro-American Spiritual was Hammered Out, summarizes the power of spirituals: “to give the community a true, valid and useful song, to keep the community invigorated, to inspire the uninspired individual, to enable the group to face its problems, to comment on the slave situation, to stir each member to personal solutions and a sense of belonging in the midst of a confusing and terrifying world, and to provide a code language for emergency use.” (2) Lovell described exactly what I saw in the prison choir. The singing of songs written by choir members deepened the sense of connection that unified them. In an environment not conducive to showing emotions or weakness, the songs coded the message: No matter how I am treated or thought of in here, I can sing this song, I can express my feelings, and I can experience transcendence. My prison choirs’ engagement with the world outside extends beyond the recordings we have made. UMOJA participated in the 2012 World Choir Games, whose international judges traveled thirty miles to enter the prison and hear the men sing. The choir competed in the spirituals and gospel categories, with pieces by Betty Jackson King and Ysaye Barnwell. The men’s hard, disciplined work earned them two gold medals, which result may have represented the first time some of them had completed a shared project to memorable outcome (3). 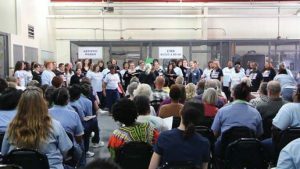 After retiring from MUSE in 2013, I brought my expertise in women’s choirs to the founding of HOPE Thru Harmony Women’s Choir at Dayton Correctional Facility. I have been able to connect this choir in shared projects with MUSE (led by Jillian Harrison-Jones), with the Earlham College Women’s Ensemble (led by Danielle Steele), and with commissioned composers Ysaye Barnwell and Rosephanye Powell. The voices in this group were also recently featured with those of UBUNTU, KUJI, and three other prison choirs in Heartbeat Opera’s Manhattan production of Beethoven’s Fidelio, in which the storyline’s political prisoner was cast as a wrongfully imprisoned Black Lives Matter activist. And so, my “retirement” looks like this: each week I drive around the state to enter three different prisons and walk the gauntlets of correctional officers—some kind, some mean, some incompetent—to get through to the residents who are hungry to sing, yearning to grow, and excited to build choral communities of healing, hope, and love in a hostile environment. Everything their choral practice gives them is something otherwise utterly missing there on the “inside.” (4) But here on the “outside” we, too, are missing something critical, which is these individuals themselves, the evidence of their humanity, and the impetus of their example to question whether the criminal justice system we currently have is worthy of the society we would be. Our collaborations with recording engineers, composers, performers, and presenters on the “outside” have helped me answer the questions: What is missing? How can I make it better? (1) Extend a Hand had twelve out of nineteen songs written by seven different choir members. (2) Black Song: The Forge and the Flame: The Story of How the Afro-American Spiritual Was Hammered Out (MacMillan Publishing Company, 1972), 198. (3) Video footage of award-winning UMOJA singing at the 2012 World Choir Games with discussion by international judges.